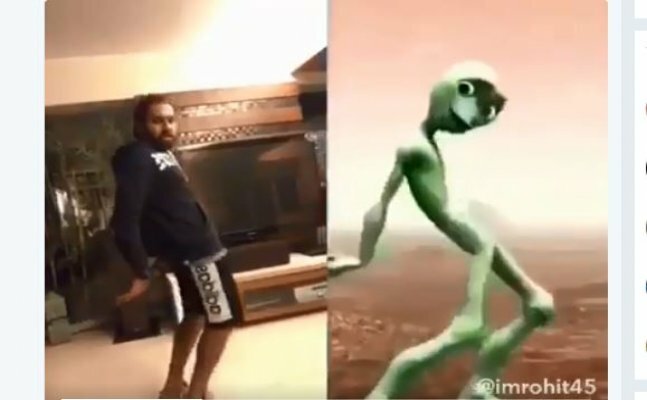 Mumbai Indians captain Rohit Sharma took to Twitter with a wacky moves with a hashtag of #DanceWithAlien challenge. The video shows the cricketer trying to copy the moves alongside the Cranky Alien with music that say Dame Tu Co Sita. The right-hand batsman also labelled the app where one can download and try the dance challenge. Before the start of the much-awaited premier league, Mumbai Indians captain Rohit Sharma took to Twitter with a wacky moves with a hashtag of #DanceWithAlien challenge. The video shows the cricketer trying to copy the moves alongside the Cranky Alien with music that say Dame Tu Co Sita. The right-hand batsman also labelled the app where one can download and try the dance challenge. The twitterites valued the cricketer's moves with lots of appreciations. Mumbai Indians with the leadership of Rohit Sharma will be determined to defend their title of last season. MI have retained many preceding players apart from Rohit Sharma. The fast bowler Jasprit Bumrah and Krunal Pandya were retained in the first-ever player retention event in January and all-rounder Hardik Pandaya and West Indies star Kieron Pollard were retained with Right To Match (RTM) in the 11th edition auction. The defending champions also used the Right to Match (RTM) card to keep Pollard and Krunal in the squad. Mumbai have blown up their squad with left-handed West Indies opener Evin Lewis, young wicket-keeper batsman Ishan Kishan and promising uncapped Indian batsman Suryakumar Yadav. Rohit is expected to lead Mumbai’s batting effort from the front along with the Pandaya brothers Hardik and Krunal. With South African Jean-Paul Duminy in the lineup, the MI can trouble any bowler in this IPL season. The MI bowling department also looks promising this season with Bumrah, Pat Cummins and Mustafizur Rahman in the squad. Mumbai Indian will fixture its season with Chennai Super Kings on April 7th.